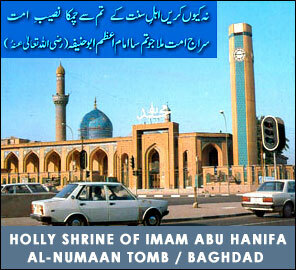 Noman bin Sabit was the real name of Hazrat Imam Abu Hanifa R.A. He was the pioneer and torch-bearer of the Hanfi School of thought, which is the largest group among the Sunnis. He was born in 80 A.H during the era of Bane Ummaya and breathed his last during the regime of Bani Abbas. Firstly, he got Quranic education and after that he concentrated on Islamic Jurisprudence. He was a devoted student of Hazrat Imam Jaffar Sadiq R.A. He had also attended the thought-provoking and informative lectures of Hamad R.A. He was blessed with extraordinary intelligence and quickness of perception. He was amazingly proficient in distinguishing different religious sects. His power of reasoning and ratiocination was out-standing and it won him a high status among the scholars of Islamic Jurisprudence. Students from every walk of life thronged around him and attended his lectures. 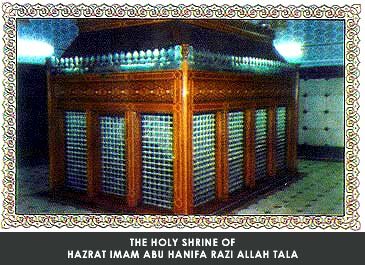 Hazrat Imam Abu Hanifa R.A was man whose opinion was strong in religious and worldly matters. His outstanding ability and preaching had won for him the title of 'Man of Opinion'. He is still known and ranked as 'Imam-e-Azam' R.A by the majority of the Muslims. He was very strict in the observance of Hadith for which he was unduly criticised by some scholars and Ulemas of his time . There is no gainsaying the fact that his standard of weighing Hadith was very strict and inflexible. He is reckoned to be the best interpreter of Hadith by all and sundry. The greatest achievement of his life was that he formulated the principles and rules of Islamic Jurisprudence. In fact, he was the unique personality who laid down the foundation of Islamic 'Fiqqah'. He declared Ijma (consensus of opinion) suitable and practicable for all ages and times to come. His contemporaries had an opinion that Ijma (consensus of opinion) should be confined and restricted to the Companions of the Holy Prophet Sallalaho Alyhe Wasalam. Some other scholars wanted to restrict Ijma (consensus of opinion) to the successors of the Companions of the Holy Prophet Sallalaho Alyhe Wasalam But the broad vision of Hazrat Imam Abu Hanifa R.A declared it suitable for all times to come. Imam Abu Hanifa R.A also interpreted the principles of analogy (Qiyas). It is needless to say that the doctrine of Qiyas (analogy) was in practice and vogue before he interpreted it. He introduced the guiding principle of 'Istehsan', which mean to give priority to one thing over the other. Istehsan (Priority) is quite comparable to the English law of equity. Hazrat Imam Azam R.A gave a great importance to customs also. According to him a large number of Islamic principles had been adopted on the basis of customs. Furthermore, there were many positive practice in customs which had been approved by him. Hazrat Imam Abu Hanifa R.A in collaboration with his students, formulated and compiled the principles of Islamic Jurisprudence. He had formed a society of forty students for the purpose of compiling Islamic laws. His prominent students, who worked for the compilation of Islamic 'Fiqqah', were Yahya bin Zaida, Hafs ibn Hiyas, Abu Yousuf Daood Altaai, Habaan, Mandal and Imam Muhammad. This society discussed and reflected over all those social and legal problems, which in the ordinary course of nature were being faced by the society at large. After a careful discussion and debate, the unanimously approved principles were taken down. This part of the compilation, which was approved by the society, was published generally. But unfortunately the complete work of the society was wasted, thereby causing a great loss to the Islamic Jurisprudence. The complete works of Hazrat Imam Abu Hanifa R.A are not available except a small booklet on Hadith, which is famous as 'Masnad-i-Imam-e-Azam'. His another work is that famous letter which he wrote to his student Abu Yousuf, for guidance and instruction, when he was appointed as Qazi-ul-Qazza (Chief Justice) at that time. Hazrat Imam Abu Hanifa R.A was in prison when he wrote this letter to Imam Abu Yousuf R.A Hazrat Imam Abu Hanifa R.A had a great respect for his disciple, Abu Yousuf, because of his intelligence and awareness of worldly affairs. Abu Yousuf's command over Islamic Laws was due to the influence of Fiqqah Hanfia on him. Imam Muhammad R.A was another famous disciple of Hazrat Imam Abu Hanifa R.A He wrote numerous books but few are available now. The office of Qazi-ul-Qazza (Chief Justice) was first offered to Hazrat Imam Abu Hanifa R.A but he refused to accept it. For this reason Abu Mansoor ordered for his arrest and put him into the prison. Ibn-e-Habeera the 'Sobedar' of Kufa awarded him the punishment of whipping. It is also said that he was given poison at the orders of the caliph of that time. He breathed his last in the jail. His funeral prayers were offered for ten days consecutively, and about fifty thousand people offered the prayers every day. Hazrat Imam Abu Hanifa rendered marvelous services for the reconstruction, organization and compilation of Islamic Jurisprudence. Though his complete book and work is not available yet his personality proved to be a source and fountainhead of law education, wisdom and knowledge for his disciples and devotees. He was the pioneer of the Hanfi School of thought. The Muslims, all over the world, follow the Fiqqah' set and preached by him because he preached and practiced what the Holy Prophet Sallaallaho Alyhe Wasalam and his four Caliphs had preached and practiced in the light of the Holy Quran. The followers of Hazrat Imam Abu Hanifa R.A are mostly living in Pakistan, India, Bangladesh, Turkey, Afghanistan, Central Asian States etc. etc. They are called 'Hanfis'. The successors of Hazrat Imam Abu Hanifa R.A and his companions are settled in Egypt, Iraq, Syria, Saudi Arabia and China. REFERENCE: ISLAMIC JURISPRUDENCE BY SIR ABDU-R-RAHIM.